The Flying Dutchmen travel for the second consecutive week meeting Concordia-Chicago in River Forest, Ill. on Saturday, Sept. 15. Kickoff will be 1 p.m. CT. The game will be broadcast by 92.7THE VAN-FM and streamed on the internet. 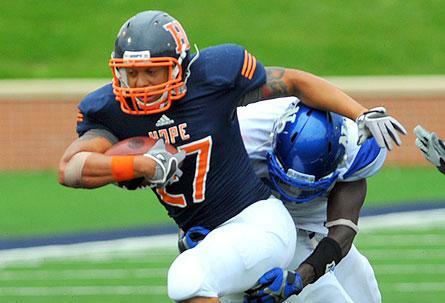 The Hope College Alumni Association will sponsor a pre-game tailgate picnic. The Flying Dutchmen are renewing a rivalry that has been dormant for 37 years. The teams last met in 1975 when Hope won 37-7. The series started in 1972. The Flying Dutchmen have won all four previous meetings. Saturday’s game is part of the new “Challenge Series” pitting the member schools of the MIAA against teams from the Northern Athletics Conference (NAC). The two NCAA Division III conferences have entered into a four-year agreement matchups that are to be based on each school’s finish in their respective conference the previous year. The home sites will alternate each year with NAC schools being the host this season and the MIAA teams serving as host in 2013. A year ago Concordia was co-champion of the NAC while Hope was runnerup in the MIAA. Saturday’s “Challenge Series” schedule: Albion at Benedictine, Hope at Concordia-Chicago, Adrian at Wisconsin Lutheran, Trine at Concordia-Wisconsin, Kalamazoo at Lakeland, Alma at Aurora and Olivet at Rockford. Concordia-Chicago is off to a 2-0 start with close victories over Lake Forest (35-27) and the University of Chicago (27-26). The Flying Dutchmen are 1-1 having defeated North Park in their season opener 42-24, but bowing last Saturday to Millikin 49-20. The Cougars in 2011 finished 8-2 for the third consecutive season. The Flying Dutchmen were 7-3 in 2011. This will be Hope’s third consecutive game against an Illinois opponent. The non-conference portion of the schedule concludes against yet another Illinois foe when the Flying Dutchmen host Illinois Wesleyan on Saturday, Sept. 22. Stat Watch: Freshman punter Dean DeVries (Grand Rapids/Grandville HS) tops the MIAA averaging 39.2 yards per punt… Both Hope and Concordia are averaging 31 points a game… Concordia’s high-powered offense is averaging 461.5 per game, including 292.0 yards from passes. Hope’s pass defense is allowing opponents just 126.0 yards per game passing... The Flying Dutchmen have yet to score in the third quarter… Hope’s 10 touchdowns thru two games have been scored by seven different players… Hope’s 49 pass completions to date have averaged 9.3 yards compared to Concordia’s 14.3 on 41 catches… Hope’s time of possession through two games has averaged 40 minutes per game. Concordia meanwhile, has a 25 minute average time of possession… Concordia is 7-for-7 on red zone scoring opportunities compared to Hope’s 8-for-11. Families and students engaged in the college search will have the opportunity to connect with nearly 70 colleges and universities during the Holland Area College Night, which will be hosted by Hope College on Thursday, Sept. 27.